We have the mulch Springfield IL homeowners and commercial businesses want and need. At Cutting Edge Yard Service, more than fifteen years of providing excellent products and top notch service has prepared us to take great care of your lawn and landscaping at a fair and reasonable price. As a locally owned company we want you as customers for life and know that each and every yard needs to be cared for in the same manner we take care of our own yard. 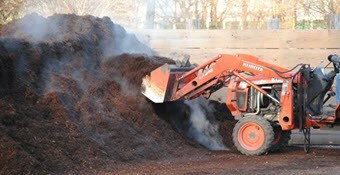 We can provide delivery of mulch to your home or business in or around the Springfield city limits. We offer a full service program and a basic delivery plan. Our full service program includes supply of the materials that are delivered as bulk or in large bags and then the raw materials are moved to their desired location and spread to the proper thickness to get the desired look and beneficial effect. For customers that sign up for our full service plan, there is not an additional charge for delivery. We also offer a basic supply and delivery program that does not include moving the hardwood materials where it is needed on your property after it is delivered. We do this for our do-it-yourselfers in the area that really enjoy working in the yard and don’t mind the additional manual labor of moving and spreading their own materials. There is a twenty bag minimum per order and we have a small and reasonable charge for delivery for those customers wanting the basic service of supply and delivery only. “When you order our full service mulch delivery and installation, we will provide FREE pre-emergent weed control application in the mulched area”! Need Immediate Help With Mulch Now?